Cut Type & Size: Cross Cut, 3/32" x 5/8"
The MBM DestroyIt 2360CC cross cut shredder is an office shredder suitable for use between 1-5 people. It shreds paper, paper clips, staples, credit cards and has a slightly higher security level 4 rating that makes it suitable to shred confidential documents also. This paper shredder comes with a transparent safety shield in the feed opening that prevents fingers from reaching the cutting blades. The DestroyIt 2360CC uses photo cell sensors to start and stop shredding as these sensors continuously detect paper near the feed opening. 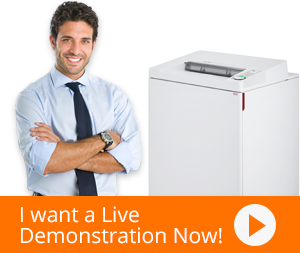 It is a jam free shredder as it reverses during paper jam and powers off, allowing a hassle-free shredding experience. MBM 2360CC cross cut shredder includes double motor protection to prevent the motor from overheating. The powerful steel cutting blades come with a lifetime warranty thereby, it does not require frequent maintenance. Its waste bags are reusable and the shredder stops shredding when the bag gets filled up. It goes into sleep mode an hour from last use to save energy costs and comes with caster wheels for mobility.